Donald Mitchell, the son of Seth and Florence (Jackson) Mitchell, was born on November 5, 1930 on the family farm north of Lake Wilson, MN. He grew up on the farm and attended country school. In 1948, Don decided he wanted to be a cowboy and left for Moore, TX, Nara Visa, NM and Ordway, CO to be a ranch hand. After a couple of years of living the cowboy life he decided it wasn’t for him, so in January of 1951, he enlisted into the U.S. Air Force. Don completed his training in San Antonio, TX and was sent to welding school in Chanute, IL and was then stationed in Limestone, ME until October of 1953. He was given his honorable discharge after the Korean War and returned to Lake Wilson. Don was united in marriage to Dorothy Runia on May 14, 1954 at the Slayton United Methodist Church. After their marriage they lived in Walnut Grove, MN where he worked in a welding shop until the fall of 1954 when they moved to Slayton. In the spring of 1958, Don was involved in a near fatal construction accident, and over the next 4 years he endured multiple surgeries. By 1962 Don bought the Doug Mihin Construction Company and they moved to a farm north of Hadley, MN. Don sold the business in 1985 and they moved to Rocklin, CA and managed duplexes and homes. In 1994 they returned to Slayton and by 1995 he began working for the city of Slayton Public Works where he worked until the fall of 2018. 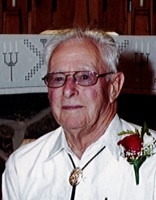 Don passed away on Friday, January 18, 2019 at the Sanford Hospital in Sioux Falls, SD at the age of 88. He was a member of the Slayton United Methodist Church and served on the board as chairman of the trustee for 9 years and remodeled the kitchen cabinets. Don also was a member of the Lake Wilson American Legion Post 285 and of the Murray Mixers Square Dancing Club. He was a jack of all trades and loved woodworking, repairing old furniture, helping with home projects, and puttering in his shop. He took great pride in helping his family with various projects. Don enjoyed playing cards and dominos and traveling, especially to Canada, Mexico, England, Holland and Belgium. Survivors include his wife of 64 years, Dorothy Mitchell of Slayton, MN; 8 children, Lee (Gail) Mitchell of Harrisburg, SD, Leon (Jeanette) Mitchell of Paris, TX, Joanne (Gordon) Swan of Hadley, MN, Carl (Anita) Mitchell of Rapid City, SD, Ronald (Elizabeth) Mitchell of Slayton, MN, Lorraine (Randy) Pratt of Rio Rancho, NM, Neil (Cyndi) Mitchell of Roseville, CA and Allen (Tessa) Mitchell of Box Elder, SD; 22 grandchildren; 27 (and counting!) great-grandchildren and 2 brothers, Lowell Mitchell of Carson City, NV and Lyle (Joyce) Mitchell of Farmington, MN. He is preceded in death by his parents and 2 brothers, Dwaine and Marlo Mitchell. United Methodist Church Slayton, MN at 10:30 AM on Thursday, January 24, 2019 with Pastor Ethanie Schmidt officiating. Special music provided by Bruce Dysthe. The pallbearers are his children. Interment at Slayton Memorial Gardens Slayton, MN. Visitation will be Wednesday from 4 to 7 PM at the Slayton United Methodist Church and one hour prior to the service at the church on Thursday. The Totzke Funeral Home in Slayton is assisting the family with arrangements.